July is a distant memory of 6am wake up calls for my high-schooler who took PE over the summer, balanced with my getting more than five minutes of peace and quiet—time to read about early childhood and science, to think my own thoughts and get hungry for conversation. Summer school is a wonderful thing and I thank all the teachers who work it. 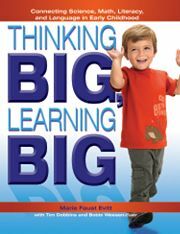 July’s reading, Thinking BIG, Learning BIG: Connecting Science, Math, Literacy, and Language in Early Childhood by Marie Faust Evitt, with Tim Dobbins, and Bobbi Weesen-Baer (Gryphon House 2009—also the publisher of my book), has become September‘s lesson plans. This book of activities reinvigorated my thinking which was in limbo because a building move had one of “my” schools on tenderhooks about our opening date and the use of space. Aligned with national standards in reading, literacy, math, and science, Thinking BIG helps me see where the science activities I know and love can incorporate more language and math goals. With intriguing, classroom-tested activities which are insightful about children’s desire to explore and imagine, Evitt also meets teachers’ needs for activities which are possible, teach concepts, and come with detailed directions for how to implement. Her approach expanded my thinking—although I usually think of sprouting seeds as an early spring activity, Evitt explains that children are curious about the seeds they discover in fall from flowers and inside apples and pumpkins. The playful spirit throughout the book is so enjoyable—predicting how far popcorn will fly, playing air hockey, and making a giant rainbow! The authors understand that children are attracted to all things BIG and they will remember the concepts they learn through those activities! Marie and I became penpals before her book was published, and we collaborated on a workshop for an NSTA area conference. She’s a fun presenter—look for Marie Faust Evitt and Mr. Tim at the NAEYC national conference in Washington, D.C. this November. Here’s what I found especially useful in Thinking BIG, Learning BIG: Movement ideas, Insights into children’s thinking, Teacher-to-teacher tips, games, book lists, skills assessments, and Discussion Starter questions. Instructions that involve movement with language—clapping when first saying vocabulary words (SCAD system of “Say, Clap, Act out, Do again”), crouching down to “become” a seed and then sprouting a root (leg), and using American Sing Language to say the new word. Insights about children’s thinking are on every page. For example, when children graph, they want to remember which object they put on the graph so teachers should make the graphs big, or should I say, BIG. For example, if graphing favorite flavor of apple (green, yellow, or red), give each child an apple shape big enough for them to write their name on before they add it to the graph. The graph is poster size, made from more than one sheet of paper. In the seeds chapter, a “How Our Seeds Germinate and Grow” number line chart with days 1-12 (more age appropriate than a calendar) is used for both predicting if anything will happen with the soaked bean seeds, and recording what is actually observed each day. Teacher-to-Teacher Tips are full of details, specific information to implement the activities. In the Seeds chapter, Evitt recommends using pre-cut bean shapes for children who become frustrated if they have difficulty drawing their predictions and observations, and describes steps to teach children to draw the bean shape. The games and stories (used in every chapter) creatively convey concepts. Children predict which square on a grid will catch the most popcorn kernels as they fly out of the popper, and act out The Little Red Hen while learning about seeds we eat, and play a “Traveling Seeds” game to learn how seeds travel. An extensive book list for every chapter (sometimes 2+ pages!) with descriptions takes the guesswork out of which book to read. The useful Skills Assessments are in the form of questions directing the teacher to reflect on the children’s abilities and understanding: What kind of pencil grip does the child use? Can the child use the vocabulary? Does the child see the connection between the wheat seeds and flour? Can the child count correctly the number of dots on the card? This book is going to help me make the transition to the new physical space and to incorporating more specific math and language focus during science activities. Hope you get a chance to view it online or at a conference. This entry was posted in Early Years and tagged activity ideas, assessment, early childhood, integrated, resources, standards. Bookmark the permalink. Trackbacks are closed, but you can post a comment.